If you're looking for a natural (and effective!) way to battle the symptoms of a cold then a hot toddy is the perfect cure. Each ingredient in this simple drink help soothe congestion, cough, and aches. It was only a few years ago that I discovered how useful a good hot toddy can be, and now I can’t imagine heading into cold and flu season without supplies on hand to make one. Between the comforting sweet taste to the aromatic steam rising up from the glass, this drink really does cure what ails you. I’ve also been trying to limit how many drugs I take while sick (such as Nyquil) and this drink has managed to pick up all the slack and then some. I also love that this drink only takes for simple ingredients to make. Well, I mean, I always love easy recipes, but I especially love them when I’m not feeling well. Because when your energy is in short supply, ease and efficiency matter the most. 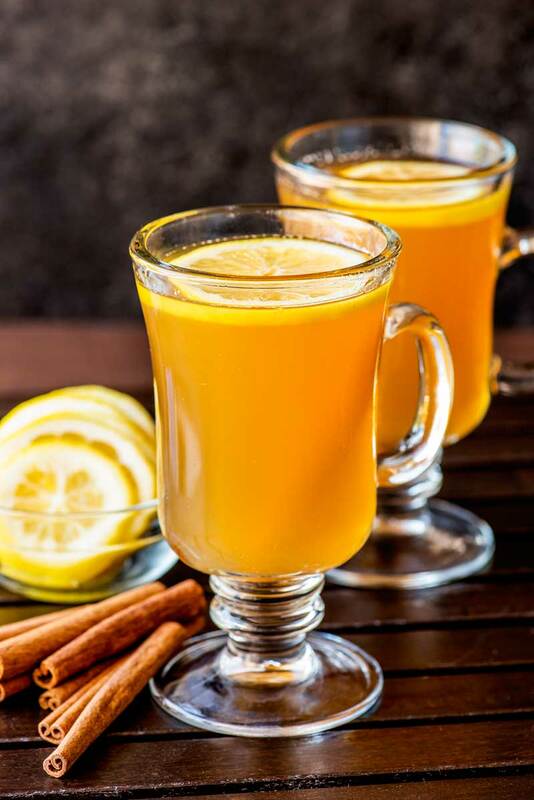 A hot toddy is known as a “cold curing drink.” It’s made from a mix of alcohol (whiskey and bourbon seem to be the most popular), honey, lemon, and hot water. Other herbs and spices are sometimes added for taste or other medical benefits. How does a hot toddy help a cold? 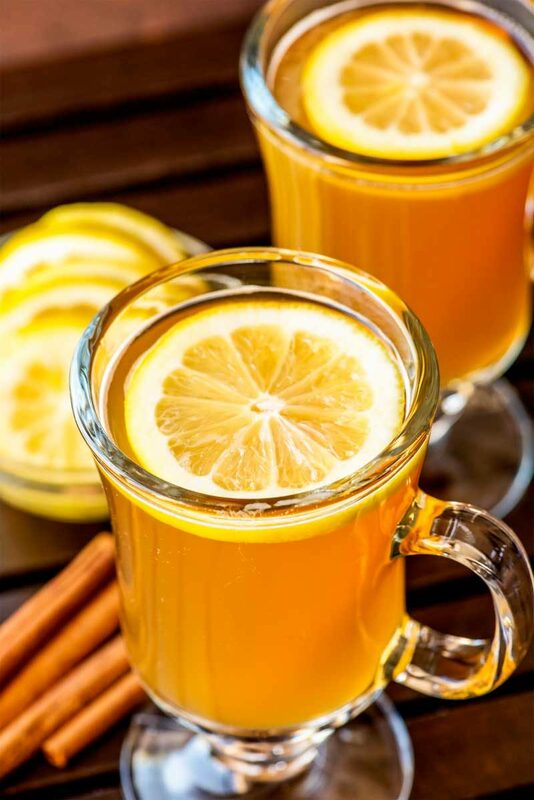 If you’re looking for a more natural way to combat a cold, a hot toddy should be at the top of your list. 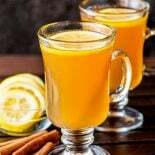 And while this drink isn’t a magical cure, the ingredients will go a long way in helping you toward a speedy recovery and calming some of the worst cold symptoms. For example, whiskey and bourbon are great infection-fighters and decongestants. The alcohol dilates your blood vessels, making it easier for your body to fight off the infection. Plus, a good shot of alcohol will help you sleep, and rest is always the number one remedy you’ll get from any doctor. The hot water will soothe your throat and help open up your sinuses. This recipe also includes two times the amount of water as it does alcohol, which should help combat any dehydration the alcohol may cause. And as for the other two ingredients, lemon and honey will help loosen congestion, ease a sore throat, and cure a dry cough. Recipes that measure in parts usually mean it’s written so that you can adjust the size of the drink to whatever you want and the given measurements (1 part, 1/2 part, etc) are so you can keep the ratio of the ingredients correct. This way the drink will taste the same no matter what size you need to make it. This drink is designed to be made with boiling water. You can allow it to cool before drinking, but it still should be made in a sturdy cup with a handle. A coffee mug or a thick glass mug would be ideal. You can use whiskey or bourbon for this drink. The main difference between the two is geographic (bourbon is typically made in Kentucky), so if you have a drink or flavor you prefer, feel free to use it. I mentioned this above, but wanted to stress again: this drink isn’t a “cure” for a cold, but it will calm symptoms and help you recover faster. Think of it as an all-natural Nyquil, just without the drug-induced haziness that usually follows Nyquil. Looking for more comforting drinks? There’s also Hot Buttered Rum and Crock Pot Hot Chocolate. 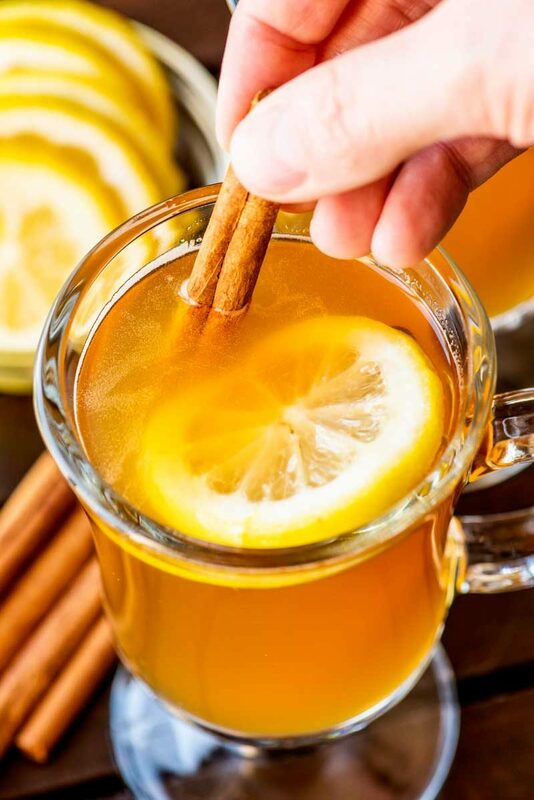 How do you make a hot toddy? Step 1 – In a thick mug with a handle, add whiskey or bourbon, lemon, and honey. Step 2 – Fill the glass with boiling water, either to taste or up to the rim of the glass. Step 3 – Drink and feel better! In a tall glass, add whiskey, honey, and lemon juice. Pour boiling water on top, ideally until the glass is full. Serve immediately with lemon slices and cinnamon sticks for garnish (optional).